Kudzu is a climbing vine in the pea family that is originally native to most of Asia but is now firmly planted in the southeastern United States to the point of becoming a serious nuisance weed. In fact, its aggressive growing habit has earned it the nickname of “the vine that ate the south” and “mile-a-minute vine.” In Asia, however, kudzu is known as Japanese arrowroot and is welcome in the kitchen as a thickening agent for soups, stews and sauces. Because the starchy root of the plant is also a good source of fiber it is referred to as ko-hemp and is used in basketry and to produce cloth and other textiles. Dried kudzu root is used to make teas, infusions and tinctures. Pueraria lobata is native to much of eastern Asia, southeast Asia, and some Pacific Islands. Pueraria lobata, a member of the Fabaceae family, is a perennial climbing, coiling, and trailing vine growing to 10 m (32ft 10in) and at a fast rate. 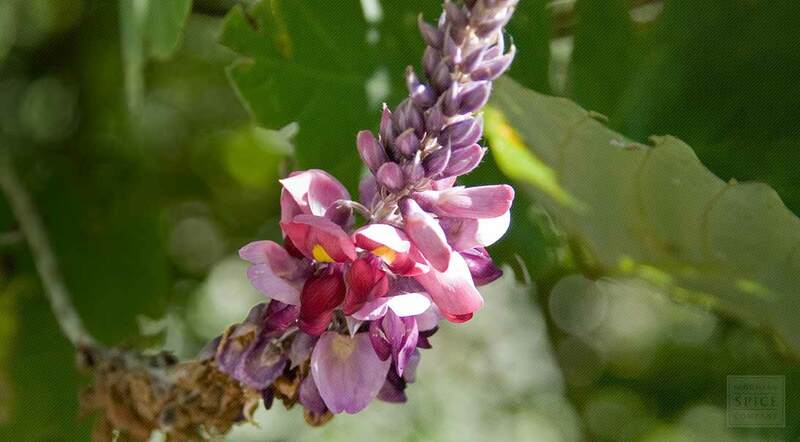 It has trifoliate leaves that have coarsely lobed leaflets and produces large, wisteria-like, purple flowers on long racemes, and beans in flat, papery pods covered with a tawny down. Kudzu plants produce long lateral runners that generate roots at intervals. It is in flower from September to October. The flowers are hermaphrodite (have both male and female organs) and are pollinated by insects. This plant can fix nitrogen in the soil, thus improving the soil. Where it occurs as an invasive species, it is considered a noxious weed that climbs over trees or shrubs and grows so rapidly, it kills them by heavy shading. The common name kudzu comes from the Japanese name for the plant, kuzu, which in historical accounts was written "kudzu". Grows in full sun in thickets or thin woods in Japan, considered to be an invasive weed in many other regions. Grows best in well-drained, loam soil. Kudzu spreads by vegetative reproduction, via stolons (runners) that root at the nodes to form new plants and by rhizomes. Kudzu will also spread by seeds, which are contained in pods and mature in the autumn, although this is rare. One or two viable seeds are produced per cluster of pods. The hard-coated seeds may not germinate for several years, which can result in the reappearance of the species years after it was thought eradicated at a site. The root can be harvested from the autumn to the spring and is used fresh or dried, cut into slices for storage. Store dried kudzu root slices in an airtight container in a cool, dry place.